Aeacus was a son of Zeus by Aegina, and had been given a populace to rule over, when his father turned ants into men. Aeacus would subsequently wed a woman by the name of Endeis, who bore to him to two sons, Peleus and Telamon. The beauty of the Nereid nymph Psamathe would also take the fancy of Aeacus, and he attempted to sleep with her. Psamathe would transform herself into a seal, but this transformation did not put off Aeacus, who did indeed end up sleeping with the Nereid. With the result that Psamathe bore to Aeacus a third son, Phocus. Telamon and Peleus would gain reputations of great heroes, but even they, in their younger days, were outstripped in athletic ability by their stepbrother Phocus. Jealousy towards Phocus, from Telamon and Peleus would grow, and this jealousy was not lessened by the fact that it was clear that Phocus was the favoured son of Aeacus. Fearful that one of her own sons would not inherit the throne of Aegina, Endeis, the mother of Telamon and Peleus, began to plot and plan. As to what happens next depends on the version of the tale being told. Some tell of Endeis encouraging her sons to do away with Phocus, with lots being drawn over who should kill their stepbrother. Thus, Phocus might have been killed by Telamon, via a thrown discus or a spear, or else Peleus might have killed Phocus with a rock, or perhaps there was no murder just an accident that resulted in the death of Phocus. In any case after the death of Phocus, Telamon and Peleus sought to hide what had happened to their stepbrother, and the body of Phocus was hidden in a wooded glen. 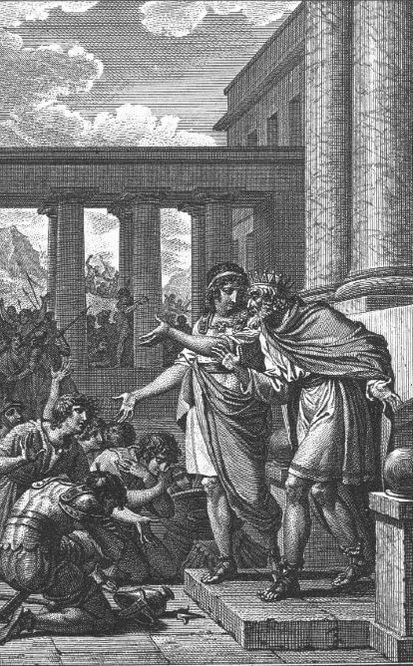 The death of Phocus could not remain a secret though, and soon Aeacus was informed that his favoured son was dead; and in punishment, no matter whether it was murder or an accident, Telamon and Peleus were subsequently banished from Aegina, never to return. Banishment would not prevent both thriving though, as kings of their own domains, Telamon in Salamis and Peleus in Phthia. The body of Phocus was thereafter entombed in a mausoleum upon the island of Aegina. As neither Teleamon nor Peleus had suffered from the death of Phocus, other than exile, Psamathe, the mother of Phocus sought her own revenge. Thus, Psamathe sent a murderous wolf to the kingdom of Peleus, and Peleus prayed in vain to the Nereid for forgiveness. Salvation only came to Peleus though, when his wife, Thetis, intervened on his behalf, for Thetis was also a Nereid and thus sister to Psamathe. Thetis convinced Psamathe to turn her animal into stone. Some call Phocus the eponym of the region of Phocis, although it was generally consider that the Greek region was named after a different Phocis, a son of Ornytion, a Corinthian who colonised the region between Mount Parnassus and Tithorea. To reconcile the myths, later writers would suggest that whilst Phocis, son of Oryntion had founded Phocis, it was Phocus son of Aeacus who expanded the territory in a time shortly before his death. ​Before his death, Phocus was also said to have fathered two sons Crisus and Panopeus, possibly by a woman named Asteria or Asterodia. These two sons of Phocus would themselves emigrate from Aegina to Phocis.